Established in 1993, award winning Pasta Brava Italian Restaurant is renown for serving up hearty authentic Italian fare at very reasonable prices. Owner, Rolando Luceri, originally purchased the restaurant for his eldest son who then decided to open his own after two months. 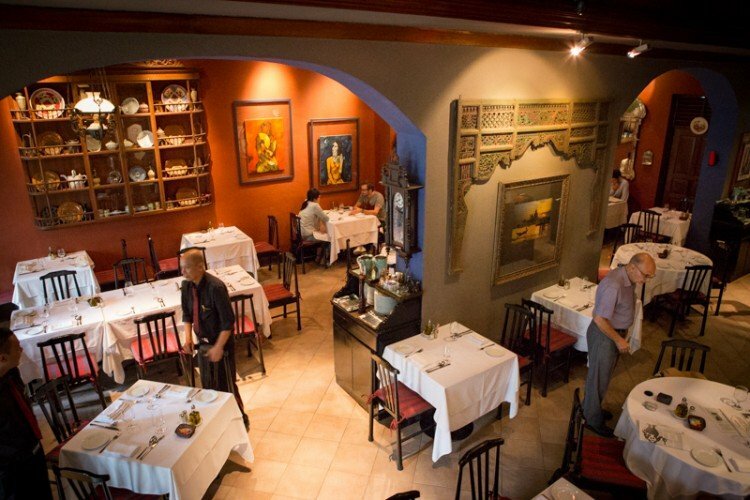 Rolando, then a hotelier managing six hotels decided to take over the reins at this popular Italian outfit at Craig Road. 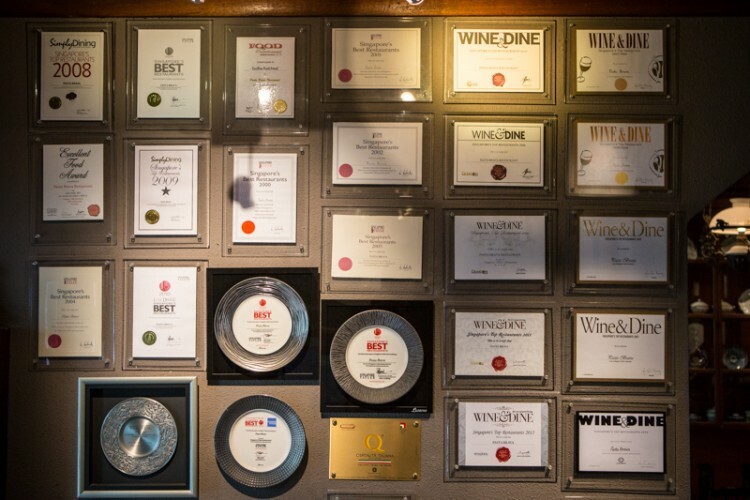 As you enter the restaurant, you will notice the walls are adorned with the numerous awards received in its 21 year existence. Despite being a true to the heart traditional Italian restaurant with a family friendly homely vibe, Pasta Brava is also a great place for a date with its bold interior and soft incandescent lights. 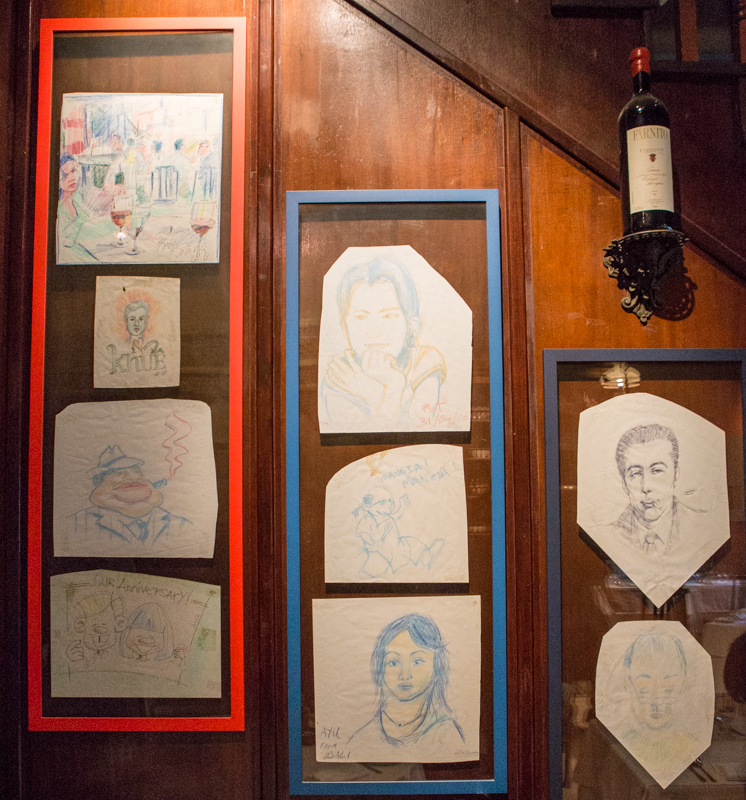 Walls are adorned with art pieces and table chalk artwork by past patrons. The upstairs section is opened up on weekends, do check out the bar counter’s shelves – it’s a beautifully restored Chinese medicinal cupboard. Stop candy-crushing and keep your smartphones away till the food comes for photos. 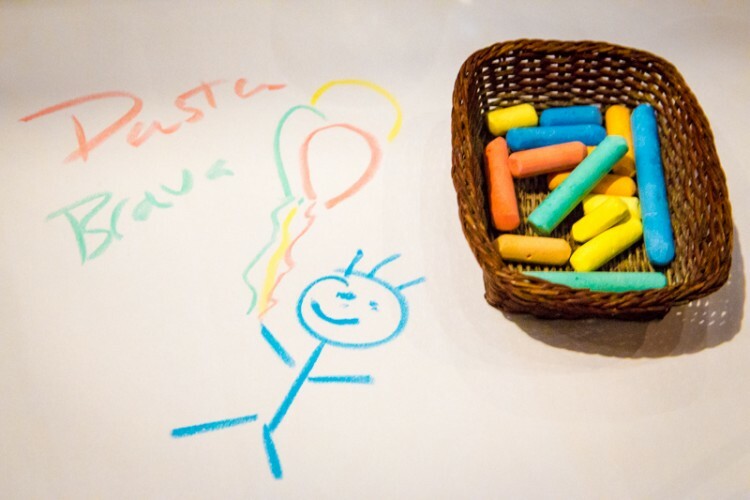 Multi-colored chalk is provided to diners to draw on the white table place mat to keep themselves entertained while waiting for their food. Quite an innovative concept, and as mentioned if your work is anything better than the 3 year old drawing we made, there’s a chance to get it hung on the walls of the restaurant. 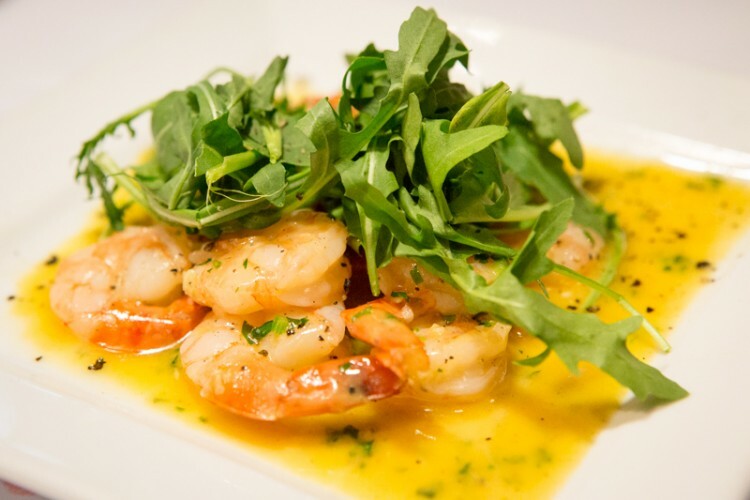 Gamberi Con Aglio E Prezzemolo – Prawns sautéed in butter, garlic, brandy, and fresh parsley ($18). A very simple dish with plump prawns topped off with crunchy roquette leaves and laced in garlic butter sauce for a hearty flavour. In most eateries, this combination will often be served tossed with pasta. 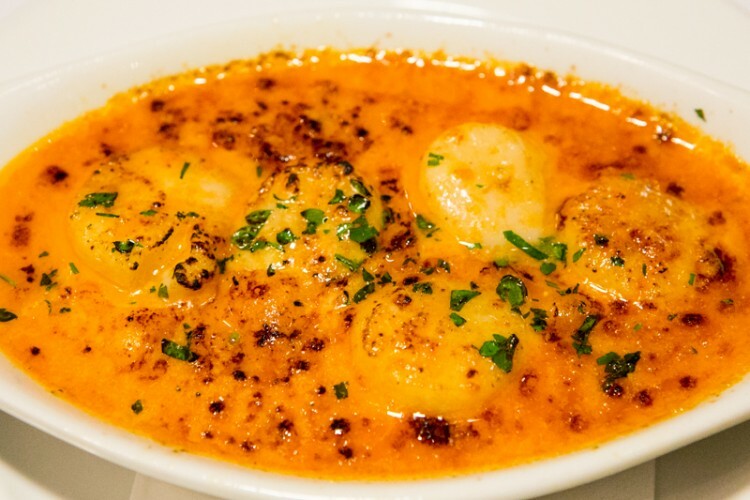 Capesante Alla Cardinale Gratinate – Scallops sautéed with white wine, béchamel sauce and oven glazed ($19). The delicate and firm scallops were delightful morsels of loveliness. The thick bechamel sauce, also known as one of the ‘mother sauces’ French cuisine, added extra body to the dish as well as some caremelied dimension from being baked which doesn’t make it as heavy. 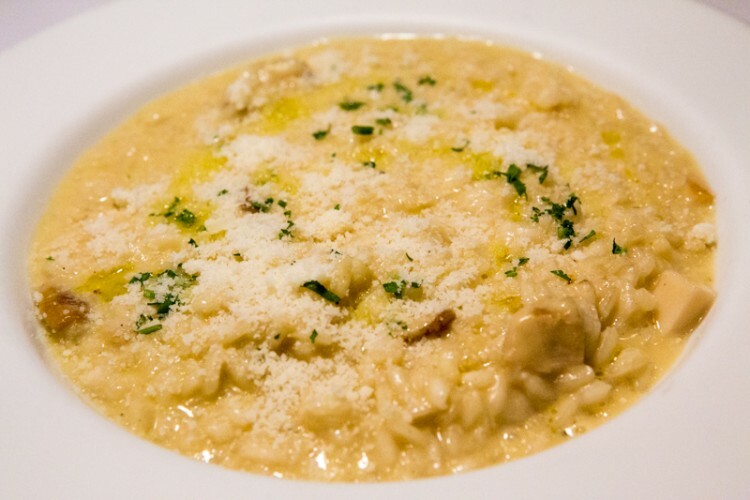 Risotto Al Funghi Porcini – Arborio rice cooked with porcini mushrooms, white wine & parmesan cheese ($24). Risottos are always been flavourful dishes with the rice grains being simmered in rich broth. However, most eateries in Singapore tend to overcook the rice into a sticky porridge like mixture rather than the authentic Italian al dente. Pasta Brava does the latter; the arborio grains still have some firm resistance with every bite. The porcini mushrooms added a springy texture akin to the scallops from the previous dish, while the thick vegetable stock is further enhanced with some truffle oil – vegetarians will love this dish. Spaghetti Della Pescatrice – Spaghetti with seafood in squid ink sauce ($24). 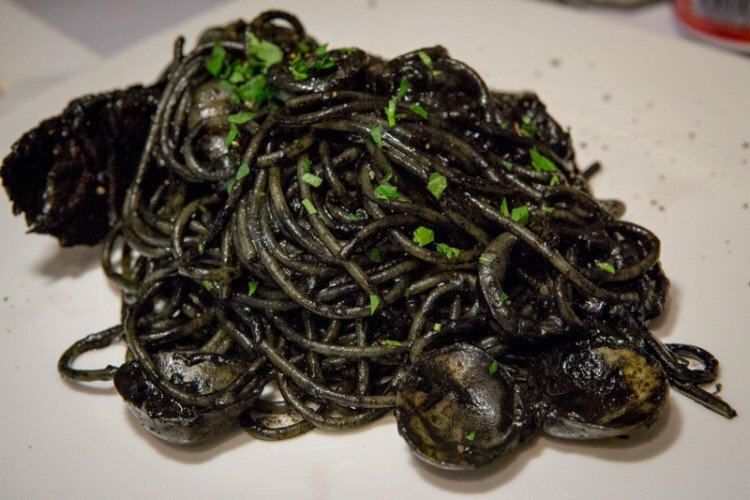 One of Pasta Brava’s signatures, this briny black dish composing of squid ink pasta has a naturally fragrant oceanic aroma synonymous with squid ink. Generous with seafood – crayfish, scallops, prawns, clams, and squid (of course), this was a clear winner for us, and we can see why its one of the most popular dishes here. Be wary of eating this with a date though, as your teeth will probably be stained black. 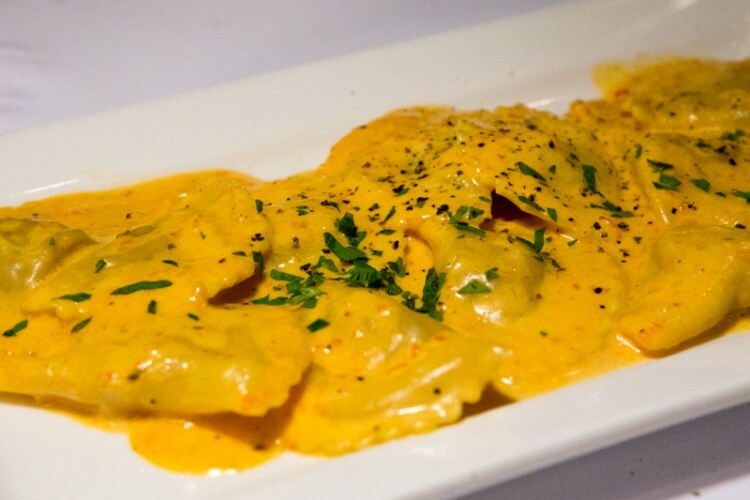 Mezzelune Ripiene Di Zucca – Half-moon shaped pasta filled with pumpkin, in a red capsicum sauce ($23.50). Somewhat similar to ravioli, the homemade pasta done al dente is generously filled with mashed pumpkin and drenched with a sauce that has an aftertaste akin to laksa (tasted like coconut milk) which takes the edge off the heaviness of the cream. Another vegetarian option. 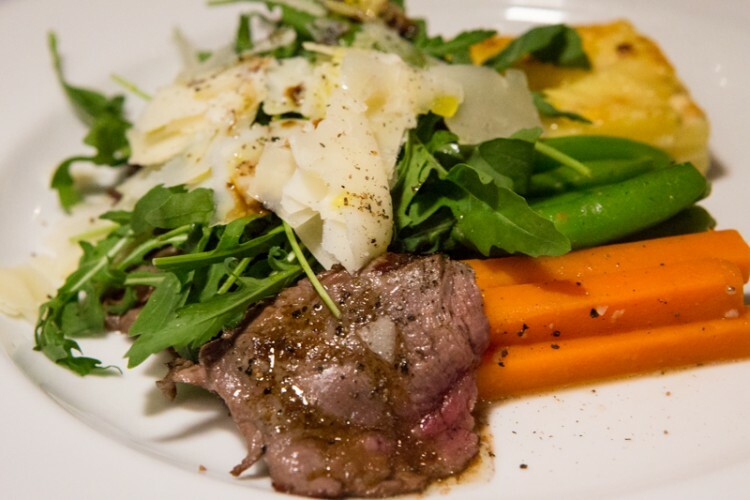 Tagliata Di Manzo Stile Toscano – Thin slices of grilled beef tenderloin with herbs, rocket leaves and parmesan flake ($31). Highly recommended by staff. Neither too thick or too thin, the medium-rare beef was juicy and marvelous. Heavily seasoned with pepper, the after taste of this beef was slightly liver-like though, while being quite lean in texture. Tiramisu Al Mascarpone E Caffe. 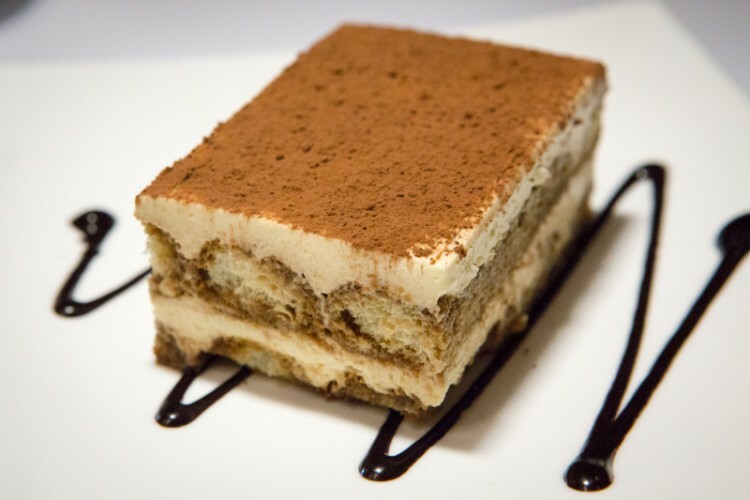 A stalwart of any Italian dessert menu, the Tiramisu is a fairly simple dessert and it’s hard to go wrong. A Tiramisu done to perfection however, is not an easy feat. The savoiardi (ladyfinger biscuit) needs to be well soaked in coffee and liquor; mascarpone cream needs to be firm yet fluffy and light; through all the Tiramisus we’ve tried, this is truly one of the best Tiramisus in Singapore. The coffee liqueur is heavy enough to taste, while the fluffiness of the ladyfinger biscuit and mascaporne is to die for. Lava Al Cioccolato. Did you know that a French chef was behind the origins of this dessert? 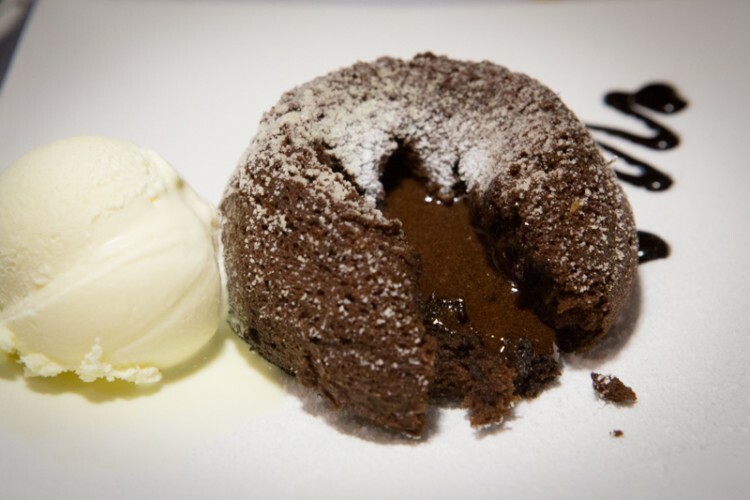 The chocolate lava cake is simple but yet difficult to perfect dessert. The cake needs to be firm on the outside, soft and fluffy inside. The melted chocolate is the tricky component, quite often you get solidified or fudge like chocolate or a very viscous chocolaty syrup. One should expect slow flowing molten lava like warm chocolate as done by Pasta Brava. 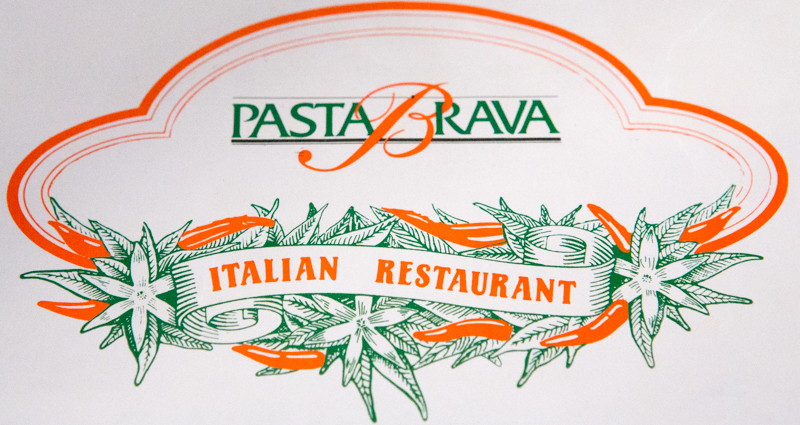 If you are looking for a good place to wind down on Friday night after work, Pasta Brava comes highly recommended (reservations are necessary). The prices are similar to other Italian eateries along the Bukit Timah/Holland/Orchard belt but the quality of the food is probably one of my favorites in Singapore.